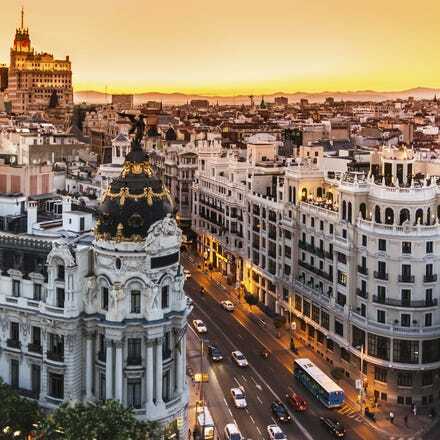 Fly to Madrid from Dublin and experience the lively Spanish capital. Entertainment and impressive nightlife caters to all tastes, with tapas bars, flamenco clubs and live jazz venues. For the art lover, the city centre houses three main art galleries showcasing masterpieces from Titian to Picasso There are ample park areas to relax and take a break from sightseeing in. For the avid football fan, Real Madrid's Bernabeu stadium is a metro ride away. It is possible that the city that never sleeps has calmed down a little in recent years. Yet, even if the bars close a bit earlier these days, you can still count on finding a party atmosphere at all times of the day and in all situations. And then, once you have had enough of socialising, you can take a few days out and enjoy the best kilometre of art to be found in Europe. When the sun sets, Madrid really comes into its own. 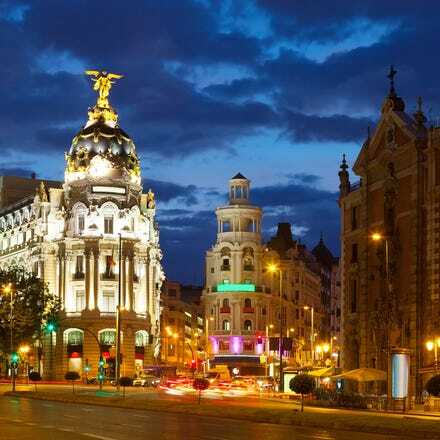 So if you fancy a night out with a difference, check out these local favourites in some of Madrid's coolest neighbourhoods. Madrid’s airport is located just over six miles from the city centre. It’s really simple to get to Madrid on the metro. To get to Neuvos Ministerios – the city’s large underground station – just hop on line 8 from the airport and relax on the half-hour ride. The Spanish capital has an excellent underground system. There are 16 lines in total, all operating both the city and its suburbs. Running from 6am until 2am every day, it’s the most efficient way to travel in Madrid.